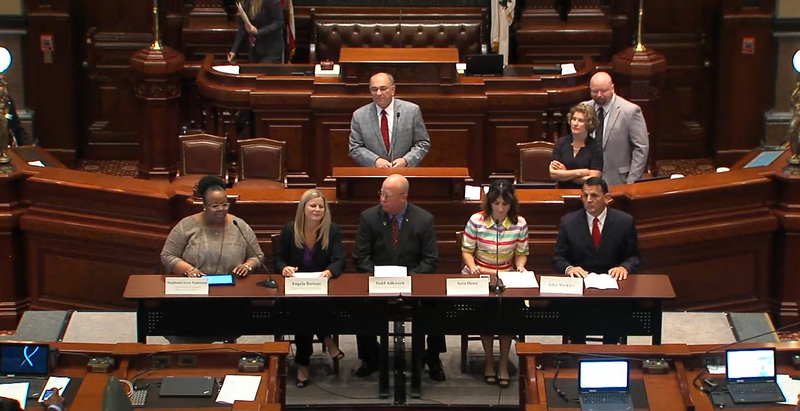 IADDA CEO Sara Moscato Howe (seated, second right) testified before Illinois House on Wednesday. (Springfield, IL) – Behavioral healthcare advocates today warned that a Illinois government shutdown would end drug treatment and mental health care services for 70,000 by the end of July. The head of Illinois’s top behavioral healthcare group today testified before Illinois House lawmakers and said that the lack of a fiscal year 2016 budget means that by end of July approximately 60,000 men, women, and children would lose their mental health care and 10,000 would lose access to drug treatments services. Howe said that years of state budget cuts have financially weakened community social service providers.